This week I began working I've beginning to finalise a small working prototype of Dawn of Civilisation. 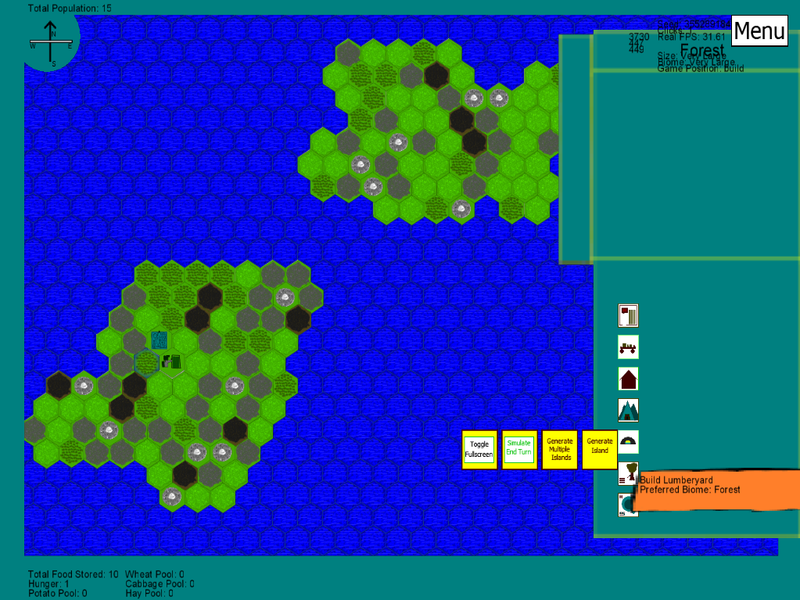 By that point - I've begun tuning the prototype's numbers rather than implementing new systems and features. In a process like this - having a spreadsheet software is definitely very useful. I have been looking into Machinations to help simulate economic information within games. However for this project I'm sticking with using spreadsheets - perhaps I will use machinations later on down the line. Once some of the parameters have been set up in a reasonable manner. I just need to add the weather and seasons system to help provide the game with some element of planning required. Finally - I was thinking on adding a few basic journal / guidelines / objectives for players to reach. This may be helpful since the game has no set aim or goal as of yet! I apologise for the very delayed post since this was suppose to be out on Tuesday - but this week has been just busy, busy and busy. Unfortunately I do not have much new in the way of Dawn of Civilisation to show as I've barely had time to work on the project itself. Up until January I do have a plan on getting a few features complete to have it be in a playable state. This way - I am free to work on my other obligations and continue working on the project following the deadlines of the other submissions! The features I plan on having implemented up to that point include the core game-play itself and the changing weather to allow for some degree of long-term planning from the player. I look forward to bringing you more updates on that later on! Progress on Dawn of Civilization is advancing nicely. 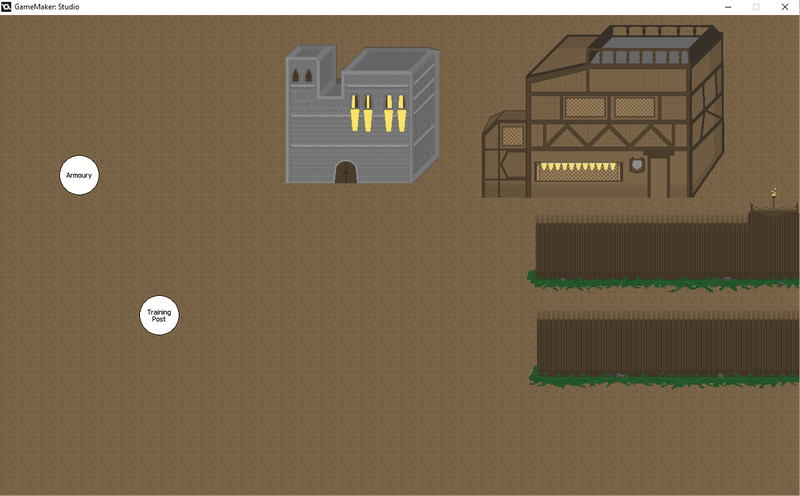 I decided to experiment with the idea of creating a larger map and allowing the player to scroll around the map. Based on the feedback I received. I was pleasantly surprised that testing it out was relatively simple and straight forward - I had the system functioning within 10 minutes. Ensuring the interface and UI buttons following the view when I previously assumed the player will remain in a single screen - took a lot longer. However - the result was very well worth it! At this point - I'm working on having a very basic playable version to get some testing and feedback done. This will help guide the project more specifically towards ensuring that the game provides the user with a fun experience. Especially in terms of the UI itself and where elements are placed and what elements would have been nice to have on hand when taking specific decisions. I hope that by the end of this week - I will have a small playable prototype to test out! The last week has been rather busy - I did manage to get some work done on Dawn of Civilization however. It was mostly a case of modifying a few existing pieces of code to allow for the consumption of foods [previously it was simply 'crops']. 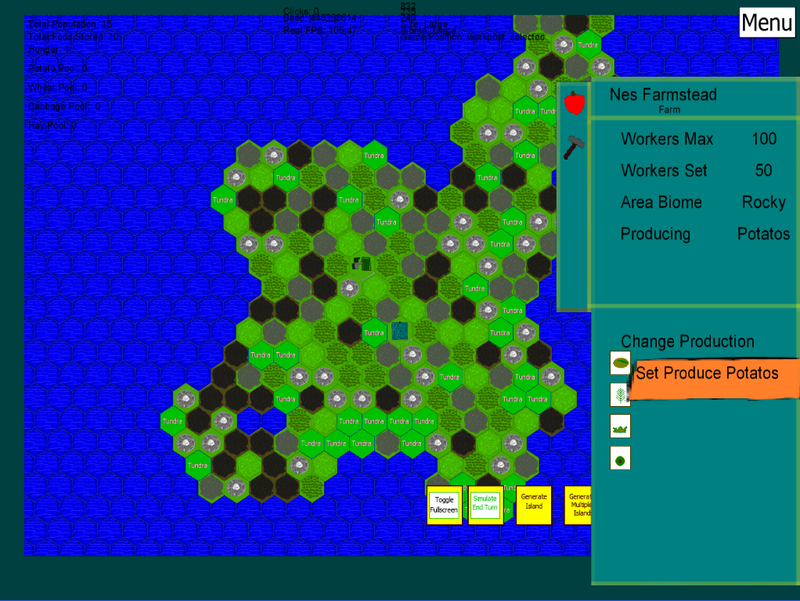 I also implemented the ability to change what a farm produces. Whilst a minor element - the code itself can easily be modified to account for other types of resources - such as ore from mines and stone from quarries. I have also modified the graphics - I admit I am not proud of it per se and I will be modifying it later on most likely; however for the time being whilst the project is still being heavily developed in it's basic components - I do not consider the visual component to be a high priority. The UI is another matter - I will be focusing more and more on making sure the UI is well-organised and placed as I get a better idea of what needs to be shown when and where; as well as what will be available in a seperate menu. I hope to have something testable by next week. Up to this point I will be adding the population growth component, the ability to set workers on work-posts, efficiency of work-posts and work-posts being affected by the tiles they occupy. Progress has been a little bit slow as I had to divert my attention to some other tasks required by my masters programme. I will be looking into the concept of 'Emergence' in games - something I hope will be both interesting and useful to learn about and explore. I have made a fair amount of progress on the project I am currently working on! Based on the plan I have drawn out for myself to ensure I reach the deadline at mid-January - I seem to be a bit ahead of schedule. The game itself is proceeding very well! Up to this point I have the map generator working to a degree I am pleased with - even though I know I can add better improvements to it. To keep to schedule I will need to leave this for a later date however. The game itself will have the player's settlement split into Districts; starting with a central district as shown in the above map. 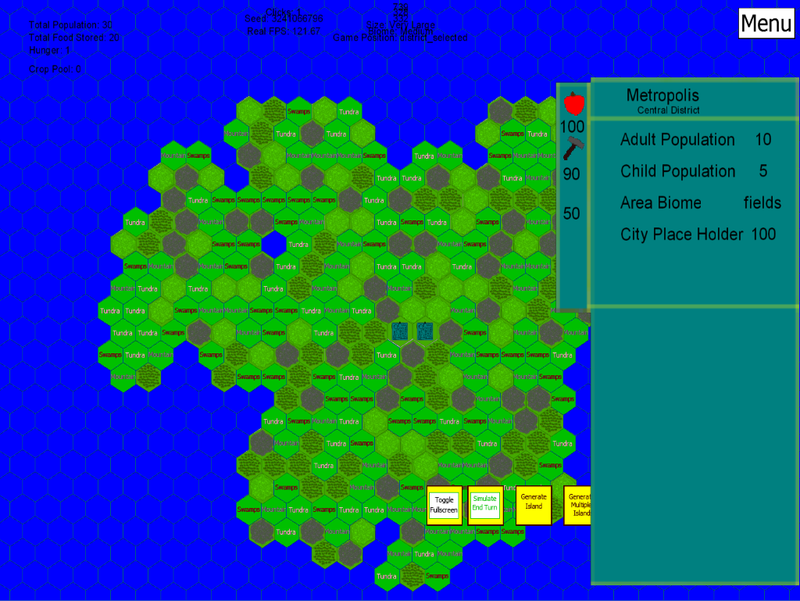 Other districts; such as a residential district, will allow the player to further grow their population - assuming they can fill the food requirements. Up to this point; the functionality for Food Consumption, Housing Requirements, Population Calculation and basic expansion is in place. However this is only a fraction of the systems needed to be put in place. Much of the above mentioned tasks split into a number of other smaller tasks that make up the element as a whole. Certain components - such as Research may very well be put on the side for a date after the deadline. Regardless I look forward to bring you further update on this project! Today's post will be short - a small update about the current project I am working on. After receiving feedback on the concept idea of the 4X game - I've decided to take an approach towards settlement management. Having re-organised and re-planned how I would approach the project - it seems to be providing a more original and fresh idea! The idea will focus more on the player managing resources and ensuring their people can survive winters and events. This means the approach I will be taking towards polishing and building the game is focusing on the Expansion and Exploitation elements of 4X. I have been brainstorming a lot of ideas but cutting down on them due to the 1 and a half month or so time span that it needs to be produced within. The schedule as is will still be very tight - the amount of tasks seems to have increased but their complexity feels decreased and of lesser scale. So I hope this means that I will be able to jump ahead of schedule fairly quickly. I look forward to bring updates on this project! During the past two weeks specifically I've had to start working towards design projects which I felt I had more limited knowledge in than others. Board-games is one such project and the other being 4X Games. Somehow I needed to gather new knowledge on these - outside of simply having played them. I'm going to be listing a few of the approaches I've used to try to gather knowledge that would serve me during design and production! 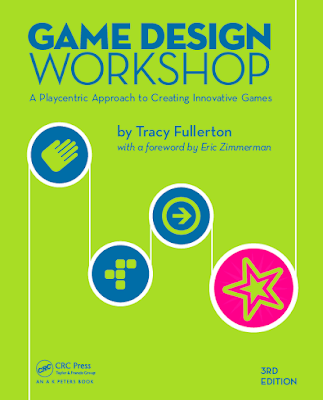 One of the more obvious steps is to actually try out games of the type or similar to what you want to create. This could give you some basic insights on what's been done, what seems to work, what you like and don't like. However this only provides very limited information. Keep in mind you are approaching the game with your own tastes, background and knowledge - other players will most likely be experiencing it differently. By looking at other players experience the game - you might be able to get a glimpse as to what is liked and not liked about the game. You might also be able to get an idea of certain conventions and elements of the genre that may be critical to your development. Included with this - you can also look at developer videos on the game and genre. With 4X games - I decided to look up not only GDC talks but also talks with Sid Meier. A good approach is to take statements said during interviews, videos and so on - and then looking at what gets mentioned a lot and how it gets mentioned. E.g. you might hear 'the player's create their own story...' - ' the world is unique to the player...' these might say a lot about what your trying to create - especially if the idea of narrative and 'uniqueness' is repeated by multiple of note individuals. Needless to say , you can find a vast amount of information online. Outside of GDC talks, you can find a number of analysis articles on different games and genres which may be of interest. Sometimes - don't be scared to think outside the box in terms of your research. If your looking into making an exploration based game - look at why people get curious or what makes people curious to explore. See how you might encourage people to explore with small clues or systems in the game itself. These needn't be specific to a genre or type of game. Don't be scared to experiment and try out new ideas. Whilst it can be intimidating to try designing a different type of game than you are used to - it can give you a lot of knowledge and insight you would have likely missed out on! As I've shown on a preview on the blog Facebook page - I have been working on a Hex-Based Map Generator. This partially began with the notion to work with a pre-set terrain generator - however; I felt this was more critical and more promising to try my hand. I will be using this generator on a project I will be working on from today to January which will likely be a (most likely) small 4x game. I've been toying with the idea to try my hand at a project of this type - I decided to go for it after being given details on a study unit in the masters programme I am participating in. Now onto the generator! 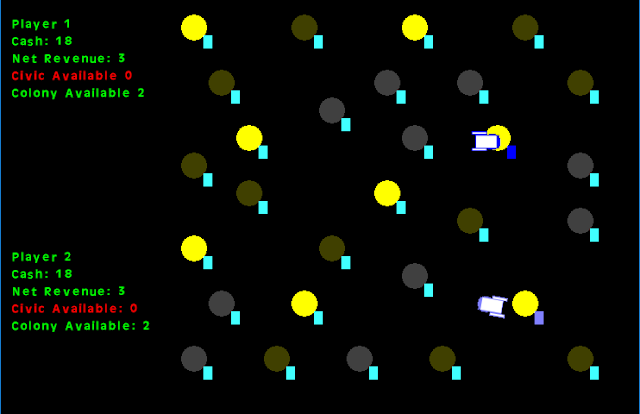 The generator itself begins with a single tile and expands outwards as you can likely tell from the above .gif. 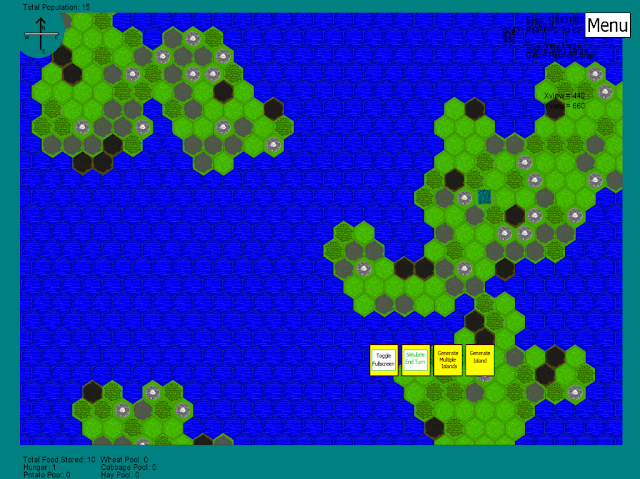 As more and more hexes are generated - the chance for the next tiles to further spawn more tiles is further reduced; creating the above 'island' or 'peninsula' effect in some of the generations. Tiles are also assigned a biome - depending on a setting - players will not only be able to determine the size of the map but also the size of biomes on the map itself. Biomes themselves are more likely to cause their adjacent hexes to be of the same type - if the biome size is set to a larger setting. Likewise if set to small - they are likely to be small biome sizes. I am planning on adding more 'behaviour' to the ways biomes are determined (For example, Tundras spawn to the far north and far south). I will be experimenting on that later on. Up to this point - I am quite happy with how the generator is working - however I do wish to add ways to switch the generating behaviour - so rather than what looks like an island sometimes is spawned - the generator will instead create continents for example and so on. The last week has been fairly busy - this week in particular is going to be a lot more busy due to the Philosophy of Computer Games conference I am currently attending - which looks like it will prove to be very insightful! Recently - I had watched a video of a talk given at the Games Developers Conference (GDC) regarding the procedural generation used in Shattered Planet. The talk inspired me to experiment further with procedural generation systems. Those of you who have read my previously Game Maker Progress posts know about Privateer Dungeoneers - which uses a very basic random level generator to create it's maps. The challenge this time is to make the generation more systematic and meaningful in a sense. 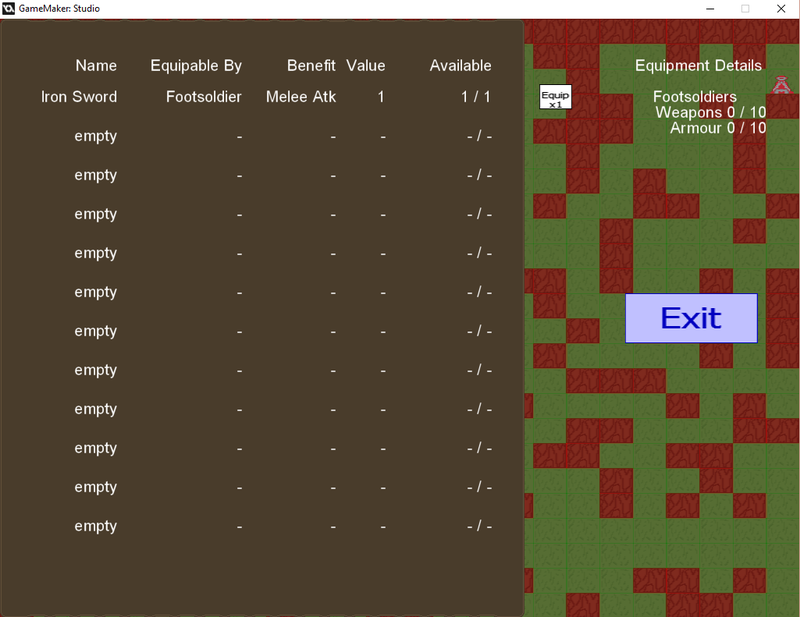 Privateer Dungeoneers' generator simply relied on chance and a few other parameters I set up to influence the chance to spawn a wall or a path tile. This obviously meant maps are extremely random - and could result in problems of having a room completely cut off from the path of the game. Worse yet - if an exit existed in the game - there was no way to guarantee the player will get to the exit without digging through a wall. I knew I wanted to re-work the generator for that project - however as other elements took precedence - that project had to be put on the side for the moment. Spelunky - similar to Shattered Planet, used a number of pre-set terrain pieces for the generator to work with. Unlike Shattered Planet - the pre-set terrain pieces had even more areas within the pre-set terrain for more pre-set terrain. The generator would therefore need to first connect 4 large pre-set terrain pieces, and then if the large pre-set terrains allowed, modify it more (I highly recommend looking at the book "Spelunky by Derek Yu" as it goes into more detail and is a very good read; I have written about it here). Looking at the video talk for Shattered Planet - a different approach is taken - where pre-made rooms are chosen by the generator, placed in the room, and are then connected via a path. I recommend looking at the video for a better look at how the system works. Regardless - I will be looking into creating an improved level generator that works with a few pre-set components. 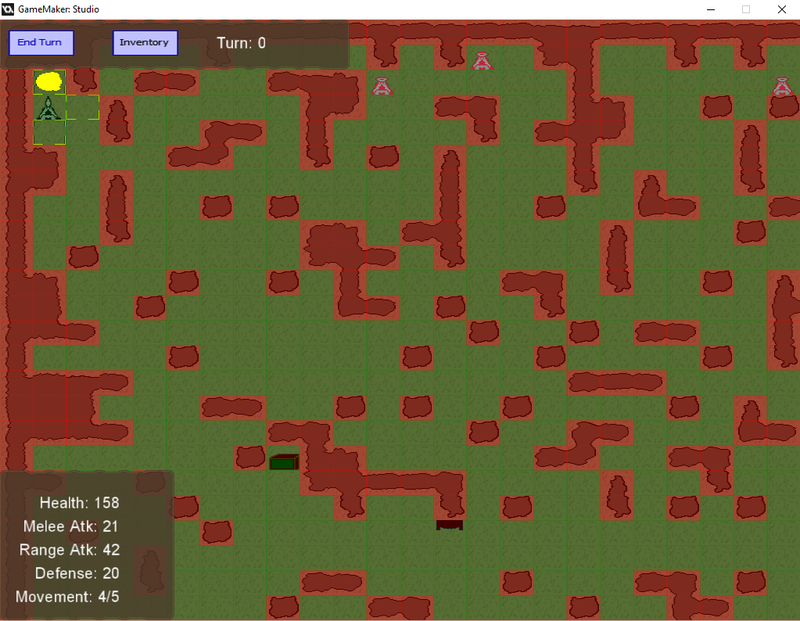 Having been inspired by both Spelunky and Shattered Plant's level generation systems. Coupled to this - I do hope to test the generator in a few different game contexts - to see how well it can be adjusted to cater for simple styles of different types of games [Dungeon Crawler, and 4x Style game]. I will likely write about this within the coming weeks - once I've had the chance to sit down and work on it. Whether this will be next week - is highly debatable as the conference will be occupying a fair portion of my time this week. That said - I am very excited to be trying out this new approach to creating random level generation! As it will both mean that the levels will appear to be more natural and meaningful - and it will open up a lot of opportunities to test out different game ideas with a single random level generator that can be adjusted depending on the type of game it is being used to generate a map for! Last week I mentioned I would write about a mini project I have worked on this week. By mini project - the project itself currently has approximately 8 hours worth of work - which is very small. It is more or less a proof of concept of the game-play itself. I'd like to thank my colleagues in particular who provided feedback on the game itself as well as play-tested it! The game itself is for two players - and the goal of the game is to earn 1,000 cash before your opponent. To do so - you will need to purchase colonies on planets. Each planet (Yellow, Brown, Grey) represent a type of planet. Yellow are civil colonies - these allow you to purchase 2 of the other types of colonies. Brown are agriculture colonies - these allow you to purchase 2 civil colonies. Grey represent mining colonies - these provide the most income from the three planets. Each planet provides both an income and expense when purchased. Once players reach certain amounts of cash (100, 300, 600 and 800) two pirates will spawn on a planet owned by each player. These pirates will seek out planets purchased by players and will begin to harass the planet. The owner of the planet will have to pay a higher expense - if the pirate is near their planet. The way you solve this issue is by flying towards the pirates - who will begin to fly away from you. The general strategy is to attempt to push the pirates onto the opposing player - to hopefully increase their expenses, and lower your own. That is the game itself in a nut shell. The interface and graphics as you can see above are highly simplistic - overly so. One of the biggest issues raised as the game was played is that both players were not sure what they were doing - since the planets themselves did not look immediately evident. The game-play itself was enjoyed - however the interface and graphics need a large amount of work. This makes sense since from the 8 hours of work - probably around 7 of which was spent coding and designing the game-play; so it makes perfect sense that these turned out to be the issues experienced by the players. 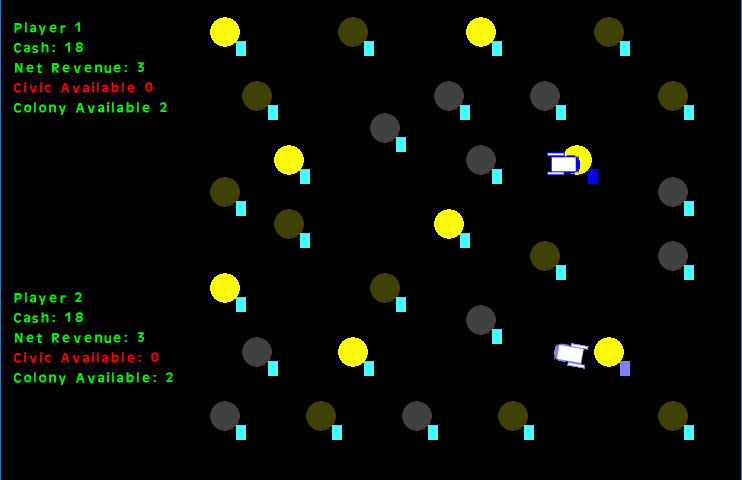 Changing the planet's sprites, making the player's ships more obvious and recognizable and providing the player with more information as to what each planet does - are the major elements that require improvement within this small project. I may spend time fixing up this project further given free time - and I will take another look at the project in terms of play testing if so! This was a very interesting mini project to work on - it was essentially a small warming up session to get back into GML coding after the month-long period I had spent prior to starting off the masters as a small rest-time before jumping into the larger workload required in the masters programme! Firstly I wanted to apologise for the late upload - with the Masters Programme time has been rather tight and yesterday was particularly tight. However - I wanted to touch a bit on Game Maker as it's been a fair while since my last post on it. That is not to say - that I haven't been using the engine or that I've moved on from it - however other posts and time constraints meant that I was limited to what I could write with regards to Game Maker progress up to now. However - as part of the Masters Programme - we have been receiving a number of tasks towards developing small projects using Game Maker. I will be unable to post a number of the works done - simply because the assets used are not mine personally - so I would rather not post work not my own; even if they are open source or free. If I don't know if they are open source and I don't know who to credit for their creation - then I will simply either use my own assets or keep it off the blog. As part of the small project I am working on this week however - the challenge was given to create a non-violent conflict game. The first idea that came to my mind was using Trade. The theme itself was in space - so Space Colonies came to mind. The idea itself - after I spent some time fleshing it out - will be something along the lines of the following. The game will consist of a minimum of two players. Players will be competing to earn the highest amount of credits. The game will be played on a randomly generated map - with 3 types of planets to start with [Plains, Forest and Asteroid]. Players can set up Civic colonies on a plains planet - which lets them maintain 2 other types of colonies. Forests will allow for agriculture colonies which will maintain civic colonies and finally mining colonies will be the major income source built on Asteroids. As both players accumulate more and more income - pirates will begin to spawn. Pirates lower revenue and increase expenses for any colony that are nearby; players will be able to fly towards the pirates to scare them away. This opens up the strategy of pushing pirates to the opposing player. This is needless to say very basic and bare bones currently. However - since the project must be complete before next Monday - it has to be rather small. That being said - I will likely be using a lot of my own work on this project - so I will look into posting more information on it next time! This week for historic inspiration I'll be looking into Sumer, the first urban civilisation - credited with a fair amount of important developments that persist to this day! With this in mind - I'll be looking into the elements of a civilisation - things to that can help when designing a civilisation within a fantasy context. When we say that Sumer is credited to being the first urban civilisation - it is because they were the first to construct large cities - some of which housed tens of thousands of people. Given the time period of around 3500 B.C. - this is an incredible achievement. To help put this figure into perspective - a Roman census at around 508 B.C. 130,000 assumed over 17 males were counted in the Roman populace - if we were to double that to assume the female population we would have 260,000 Romans. One of the larger Sumerian cities may have very well had around 80,000 citizens. Mesopotamia - the home region of the Sumerian - was dotted with a number of city-states that the Sumerians dwelled within. Each of these city states would be centered around the worship of a particular god or goddess - ruled over by a priest or king. The name of the region itself - mesopotamia - meaning the land between two rivers in Greek - would have offered the Sumerians a beautiful landscape with food and water being available close-by. The rivers, the Tigris and Euphrates themselves had a much deeper important to the civilization outside of food and water - it served as a major method of transportation. The waterways also became a critical component for trade routes - particularly due to the type of terrain that the civilization was located in. Some of the city states of the Sumerians include Eridu, Bad-tibira, Larsa, Sippar, Shuruppak, Uruk, Kish, Ur, Nippur, Lagash and a number of others. After a number of hunter-gatherers began planting gardens, as well as growing crops that needed permanent settlements - this would have encouraged a more permanent residence for the societies. This needless to say - opened vast opportunities for the society to begin developing in ways that would have been difficult had they been nomadic. Building houses, planting crops, developing tools and ideas that would have been innovative at the time. With food taken care of - individuals could begin specialising in new occupations - pottery, smithing, trading, carpentry, weaving and so on. As the Sumerian economy grew - the need to calculate and record the supplies and goods of the economy grew. So came the development of one of the oldest - if not the oldest forms of writing. Sumerian writing was done on clay tablets - using streamlined pictures to represent ideas or goods. Developing further into phonetic letters later on to develop cuneiform - for symbols of spoken sounds. As the city-states grew - the need for land grew, more over, boundaries that once separated city states became questioned; leading to war between Sumerian city states. War acted as a major driver towards pushing the boundaries of technology with the Sumerian city-states. Warriors of the time would have been armed with mostly copper and leather based equipment. Most likely copper helmets, a spear, sword and leather shields. Certain stela designs show what seem to be a phalanx formation used by warriors of certain Sumerian kings. This would pre-date the use of the phalanx within Greek society by a fair margin. Other equipment used and developed further by the Sumerians are chariots as well as the sickle sword that would become a standard infantry weapon used by the Egyptians at a later date. Certain socket-axe designs may have also been developed - as body armor designs improved within the region. Perhaps one of the most interesting aspect of this period is the fact that the warriors of Sumer may very well be the first standing professional army in human history. The decline of the Sumerians came primarily in the form of hunger, malnutrition and disease - as the land used for farming had increasing amounts of salt due to evaporating waters left behind salts in the soil after the water level had risen. The salt - having been spread due to the irrigation channels, meant that vast areas once useful to grow wheat - became far less fertile as the years went by. The salt itself - hardened by the sun, whiting the terrain and prevented further cultivation. Another large factor that lead to the spreading of illness included the fact that garbage was often burnt - if not simply left in the streets. Weakened Sumerians were ill-equipped to defend with invaders due to this. After being conquered by Sargon the Great - the Sumerians regained their independence only after the empire of Sargon fell. Only after this period of renaissance were the Sumerians again conquered by the Amorites (Westerners) did the Sumerians slowly began to vanish as an identifiable ethnicity - as the Amorites adopted the Sumerian culture. Another aspect that seemed to have lead to the decline of the civilization seemed to be due to rigidity. Whilst at the start - the Sumerians were innovators and built new ideas and concepts - they eventually seemingly became highly restricted in terms of their freedoms. As to why this was the case - is debatable. The Amorites slowly began to expand and Hammurabi was one king that began to expand his influence throughout Mesopotamia. Like Sargon before him, Hammurabi built networks of roads and postal systems to help connect the vast cities under his rule. Delegating power to governors to rule his in stead. Babylon - became a city where trade routes crossed - becoming a centre for skilled artisans, architects, and businesses. The city was surrounded by vast fields of crops - such as melons and barley - and previous materials including timber and metals were imported - if they were not available locally. In 539 BCE - Cyrus the Great of Persia conquers Babylon. The ideas and concepts, the knowledge and techniques used by the Sumerians - rather than lost to history - continued through the Greeks and Persians. Whilst one must keep in mind that many technologies, ideas and concepts might have developed independently through the world - be it in China, Mesopotamia, or South America for example. It is still worth noting the ingenuity of the Sumerians. For example, the Sumerians had issues of flooding - so they developed irrigation and dams that not only helped them relieve the issue of rising water levels - but also help in agriculture. As trade flourished - the Sumerians were very fond of lapis lazuli - this lead to the creation of contracts. These first contracts were done by rolling cylinder with a relief onto a clay tablet. The relief on the clay tablet - became the contract. This eventually would lead to the creation of the first laws. The code of Hammurabi is a well preserved Babylonian code of law that helps us see what the laws of Sumerians may have involved. Below are a few credited concepts or items to the Sumerians. Aside from the inspiration to be taken of the Sumerians and their civilisation - as I did my research I asked the question as to what exactly qualifies a civilisation to be a civilisation? Charles Reman - based on work by Gordon Childe - create 10 characteristics that may help look at civilisation. However again - we must keep in mind that these are guidelines - and not necessarily a must have characteristic. These do however provide a means to imagine what exactly would it take to create a civilisation in a fantasy setting that feels alive in a way. That has depth and makes sense if that is the aim. I hope you found this to be interesting as much as I did, and useful if you are looking into the creation of a civilisation! There is much more to the Sumerians that one can learn that would have likely taken up multiple posts - so I do encourage you to delve deeper into areas you may find to be of particular interest! This week I wanted to reflect on a concept I've been working on as of the last couple of weeks - that is the idea of building a world for an open adventure - rather than a linear one! This challenge came to me - not in the form of developing a game per se - but from the fact that I will be acting as the Dungeon Master in a game of Dungeons and Dragons within a months time approximately. My previous experience - as well as that of my colleagues - with Dungeons and Dragons is minimal; however I came to it from a more unique perspective as someone delving into game development and someone who appreciates the strength the game offers. Even though I am new - I knew that I wanted to play on the game's strength to offer my colleagues an interesting and fun experience - that is of openness. Dungeons and Dragons allows you - as a player; to do whatever you please - so long as your Dungeon Master can 'accommodate' for it. I say 'accommodate' because as I've been learning it's often a case of improvising and providing building on elements as you go. This did make me think more deeply as to the notion of designing an open world rather than a linear one in a way. In a linear situation - you simply need to offer the players the information they need, some information to keep them entertained, and ensure that whatever the players can touch - you can explain. In an open situation - this is extremely difficult, the players are human beings - more over, the game offers them large freedoms that you as the Dungeon Master should embrace rather than restrict as much as you can. There is simply so much in an area - let alone a world - that it seems to be a far too enormous task for any one person. Tolkien - the individual who built the wondrous world of Middle Earth, created it little by little. However one can always realise that the world itself can house so much more stories than Tolkien himself wrote. If Tolkien simply wrote a story and built a small world to accommodate for it - individuals interested in perhaps creating their own stories would likely have a harder time to keep it close to the source in a sense. The same goes in an open world situation - the approach I am currently taking is building a world the players can explore - a small plot that will happen - regardless of the player's intervention or not. This key point means the players will experience the world in their own fashion. The world is open and alive - the players are inside of that world, and they are not stuck in a linear position where the story requires they do A or B before anything else happens. How a system like this can be implemented effective within a digital game setting - is a more difficult concept. Adaptive systems or AIs that change the world according to actions taken by you is a step towards that direction. However - the difficulty still remains that the content present in the game - is the content present in the game. It is difficult to simply create a whole new model if a new character is interacted with - unless you are using simplified sprites and create a generation tool within the game that creates new characters as needed. That being said - there are ways and means to getting around these obstacles - more over, as technology gets better - so will our capabilities to create a more open world within games. Tynan Sylvester's A Guide To Engineering Experiences has a number of pointers that really fit well with this idea of open design in a sense. Within the book - you read about Elegant systems - systems within the game that are so useful that they create a large number of possibilities in terms of game-play - but do not make it incredibly difficult to balance and modify. As to how my approach to designing the experience for the Dungeons and Dragons game will go remains to be seen - however this is proving to be both a fun activity and a useful insightful one! I look forward to exploring more ideas and concepts like this in a more digital games fashion - as the idea does interest me highly! The last month has been rather quiet - primarily since I will be starting my master's programme in the beginning of October - so having a small respite to meditate and regroup as I embark on the next part of my journey felt important! A small update however; a couple of weeks ago I finished a short introductory course on audio production - which was very insightful! The lecturer himself was very helpful and had a number of applications to show how audio can be utilised in unorthodox ways! The course itself focused a lot on general audio production using MIDI within a Mac-based software GarageBand - however the truly insightful parts of the course came from the idea behind MIDI and ideas surrounding the field that the lecturer shared! This course - with the skills, ideas and insights, will definitely be valuable as I move forward! On another note - as I start my master's programme next month, blog posts will continue! There is a small chance that I may increase the frequency of posts - this depends both on my time available, as well as my ability to create content that I consider to be worth sharing! Historic Inspiration series will continue as well with the Sumer most likely coming up next! For those of you who do not know who the Sumer were - they were the first civilisation to create a city at around 5500 BC! More on the Sumer in the Historic Inspiration post however! This week I wanted to bring attention to flowcharts - something that the programmers among you probably know about already. However - the application of flowcharts in planning goes beyond software - particularly in the realms of designing systems for your games! For those of you who have never worked with flowcharts; flowcharts are diagrams that connect various shapes that represent concepts, ideas and so on. The various shapes used in flowcharts often have a meaning in themselves - it is a good habit to get into ensuring you follow a standardised meaning for the various shapes. For instance, the Diamond shape signifies a user choice, the rectangle a process, and in this situation, a circle or oval indicate the start or end of this flowchart's program or system. You can find the meanings of various shapes online - and use that as a reference as you work. The benefits of flowcharts is - as the name suggests, in looking how a system or program will flow. 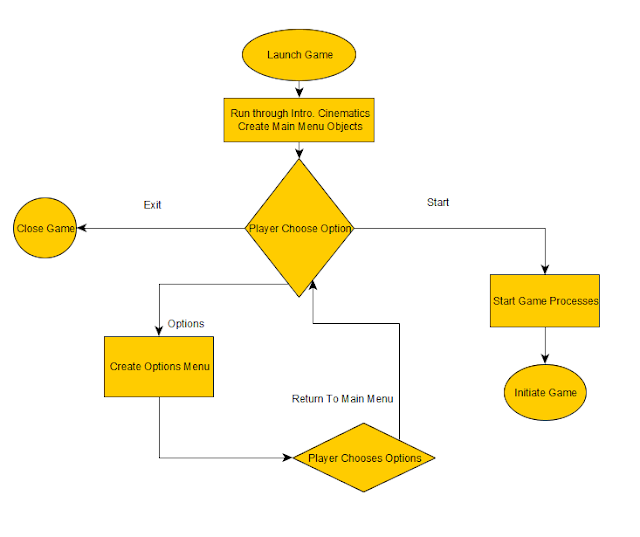 The above flowchart is a simple look into a main menu. As you work on the actual menu - you might change elements around, however the bare bones basic in representing that is similar to the example. Flowcharts can be used to plan out more than coding however. You can also use it to help think about how your various game systems will work together! 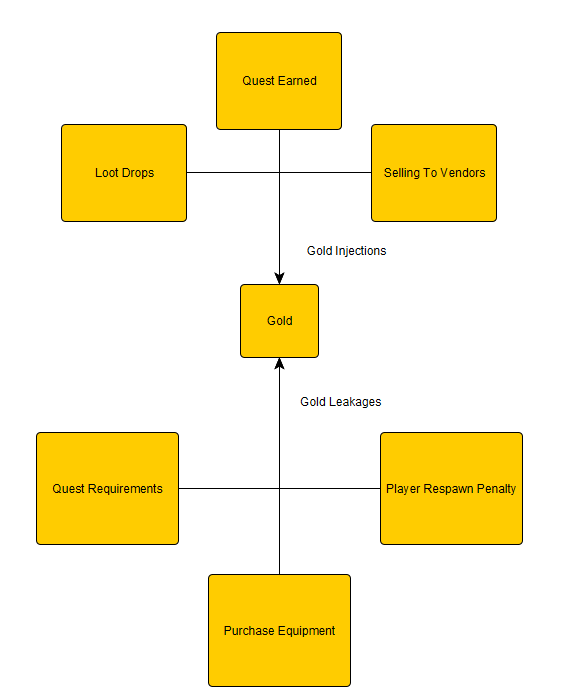 Think about the game's economy for example; in simple terms - when you create a game's economy you need to make sure you have ways to 'inject' gold into the game, as well as a way for it to 'leak' out of the game. Otherwise - the player will either have too much, or too little gold to use. The above flowchart is a very simply representation of how gold can be affected within a hypothetical game we have in mind. The player can earn gold via loot drops, selling items to vendors, and through quest rewards. If we stopped just there - gold would firstly be worthless outside of being a simple score - since the player can't spend it, plus the player will have a lot of it. We injected gold into the game's economy - yet there is no reason for it to be scarce, since there is no way for it to be leaked out so to speak. Knowing this - we can create a player respawn penalty that will take a portion of gold each time a player respawns, we can require the player to purchase certain quest required items, and we can also let the player purchase equipment. These two in combination - injections and leakages, allow the player to both earn gold and use it to their benefit. This is a very simple system we have listed here - but imagine if we had a lot more different ways to inject and leak gold out of the economy, what if we had even more types of currencies? The flowchart in this case would get more complicated and larger - but it would also be very useful in helping us both plan and balance out the game's economy! Needless to say - you can always make flowcharts on paper, even in paint! I personally use yEd Graph Editor. It a both intuitively made software and it is also freely available to use at the time of me writing this post! So give it a try if you think it can help you! I hope this has given you a view into the benefits of using flowcharts to plan out your systems - as well as code! It can be time consuming at times - however it is well worth it when you are working on a fairly complicated system! This week I decided to show you a small side-project I've been using as a rest when ever I felt like coding but wasn't keen on working on Privateer Dungeoneers. Up to this point - Grid-Conquest as I've called it, clocks up to around 4 hours work - I'm rather fond of how it's turning out! 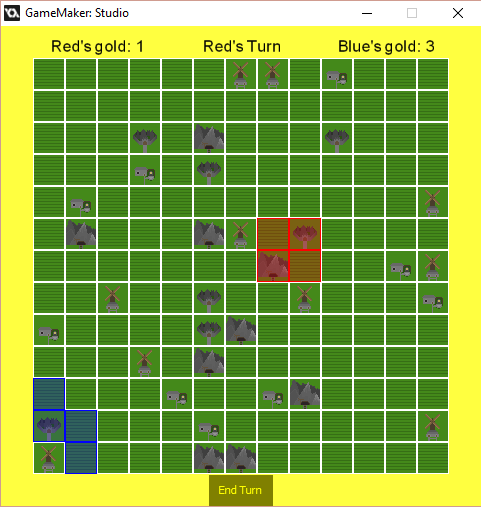 The game is played by two players - each in control of a kingdom, blue or red. Your goal is to expand your kingdom and earn more gold than your opponent. With that in mind - there are a number of different territories or tiles you can purchase. At the moment - the game has a total of 5 different tiles. The farm tile is the most common tile as can be seen above. It provides the player a minor income as well as the ability to expand their territory. The mines are a more expensive tile that will provide a higher return than your farm tiles. 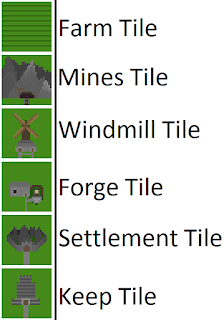 The Windmill and Forge are tiles that are complimented by owning other tiles. 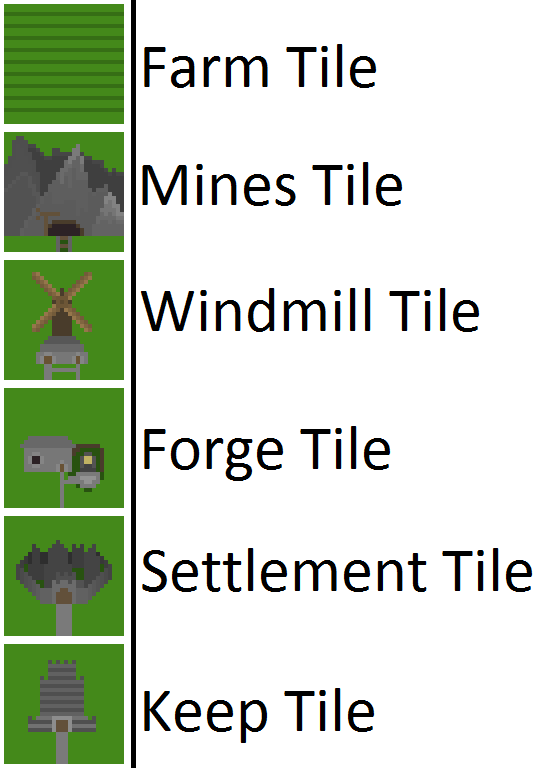 The Windmill gives you more income the more farm tiles you own, and likewise the Forge gives you more income the more mines you own. The Settlement tile is an expensive tile that gives you a small amount of income - however it has 1 distinction between other tiles. All other tiles require you to own territory adjacent to it before you can purchase it. Settlements are an exception - they allow players to purchase even if they do not own territory adjacent to it. This allows a player to expand in regions if they have the money to purchase a nearby settlement. The Keep tile is currently not used in-game because I'm debating how to implement ways to interact between the two player kingdoms. Be it using raiding - or perhaps even allowing players to capture opposing player's regions. The Keep would serve as protection against raids and capture. That's the idea up until now at any rate. I still need to decide where I want to take that concept however. The game itself plays using a mouse - I am also thinking it might be a perfect fit for a tablet game since both players use the same 'mouse' input. It may also provide me a means to test out network coding and play. The way the game is coded does allow for more than 2 players - so that can also be an idea I can toy with! This week it was a small update - but a rather significant one! I managed to implement a simple system that adds a fair amount to the game itself. Many games use fog of war to hide information from the player and encourage them to explore. In this situation the situation is similar! There are a few adjustments I am looking to make to the system - such as making the edge of the fog be smooth similar to how the walls work within the game using a Smart-Tile system. When I added this feature the game immediately felt far more fulfilling - not knowing whats behind the next corner is part of the value of the experience the game seeks to provide - exploration! 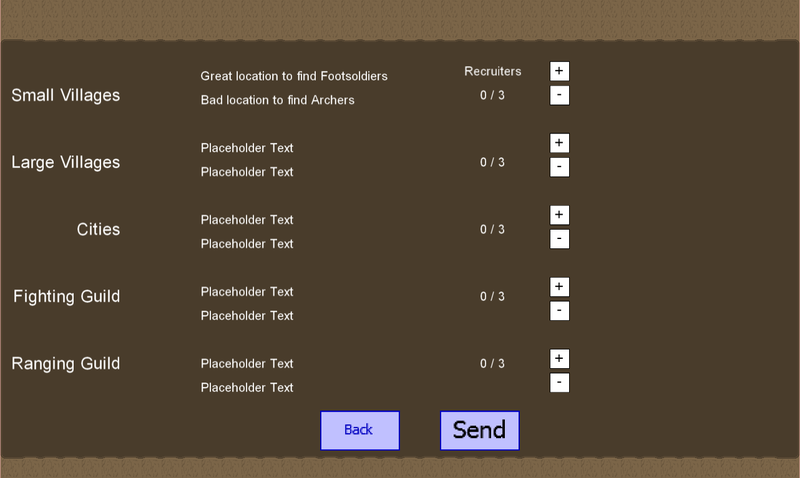 I'm quite excited by what I have to show you this week - I implemented the basic recruitment system into the game! The system is quite essential as it is required for you to not only re-coup fallen troops but also progress forward in terms of increasing your army size - allowing you delve deeper into dungeons, and defeat larger enemy forces! The system currently functions by allowing you to send recruiters to 5 different areas. Each area has it's own parameters that determine what types of troops come from that area. The amount of recruits you get depends on your Renown - which you earn by clearing dungeons and conquering enemy forces, you also lose renown by actions such as being defeated. You can also increase the amount of recruits from a particular location by sending in more recruiters to that particular area! After you send your recruiters - you move onto the recruitment report screen. 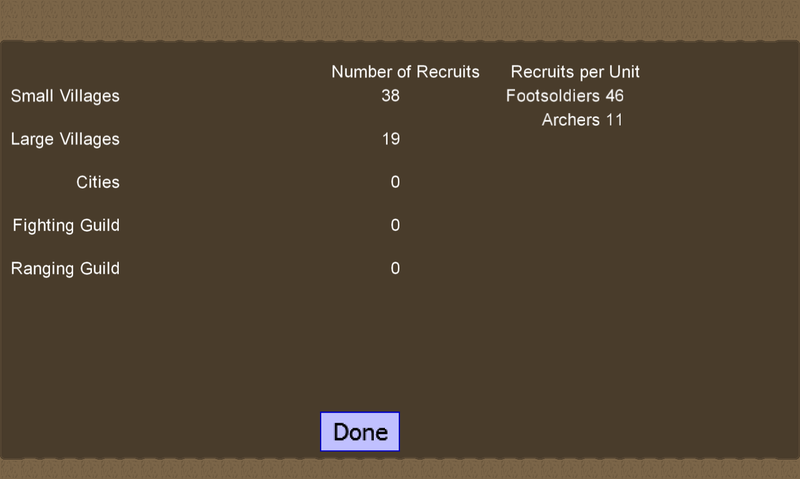 As you can see - this screen shows you how many individuals you were able to recruit - as well as the types of units these recruits will join! As I continue to add different types of units - areas such as Cities and the Guilds will be a valuable location to seek elite units - however if you limit the amount of troops you have to only elite - then the loss of these units will impact your army greatly in terms of stats. Earning more renown and gaining recruiters would be the way to bring forward a large force and to progress forward! I look forward to bring you further updates! I recently discovered a new pixel art application that has proven to be quite useful - especially when the software I usually use isn't available. Piskel is both free and has most of the basic features you'd want to draw pixel art - I recommend checking it out, particularly if you want to have a web-based drawing software you can access from anywhere that you can access a browser! After experimenting with Piskel - I also decided to try out a different style of pixel art. I decided to try out some grey-scale drawing and I immediately enjoyed it! The style is minimalist and the challenge of creating objects and representing lighting via only shades of grey was both entertaining and beautiful! After I made the trees, I decided to create some rocks, and a cart. I made them as seperate tiles in Pyxel Edit and then experimented with the background and brought them all together to create the above image! I'm going to continue drawing more objects and adding onto the image and see what I can come up with! I am excited to be showing what I have manage to implement in the past week or so. Those of you who follow the blog will remember I decided to code in what I nick-named a smart-tile system for my previous small project Sky High. The system simply checked what adjacent spaces were occupied by - such as a tile or empty space - and adjust it's sprite accordingly. Relative to this - that system was extremely simply since it worked with around 8 different variations if not less. 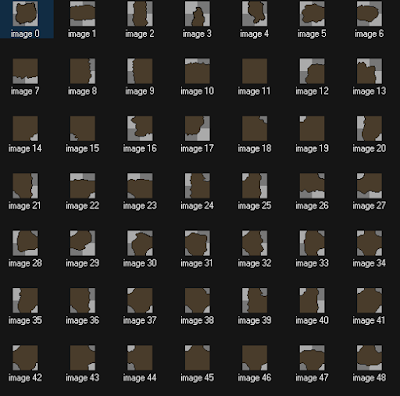 This new smart-tile system I am using for Privateer Dungeoneers uses 48 different tiles - each with their own separate conditions to check whether it should be used or not. It took a lot of tweaking and adding new tiles (originally I only pictured around 20 tiles needed - after testing and checking for tiles that seemed off, the reality was I needed 48 at least). That being said - I love how the result turned out! 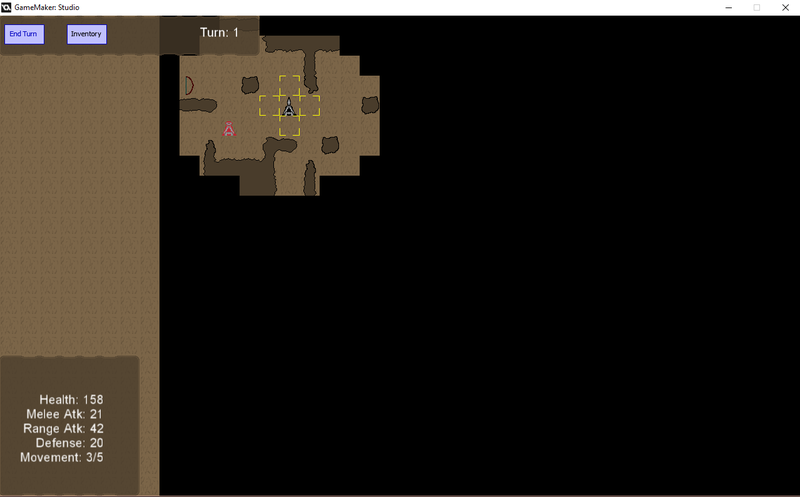 The benefit of the system I have now is that it works with the Random Room Generator (RRG) fairly well! So any adjustments I make to the RRG means that the smart-tiles will simply adjust accordingly to what is needed! Another benefit is that whilst the above image shows an example of a room generated and the smart-tiles in action - I can simply add even more tiles than the minimum 48 to add variations to the various different tiles! Adding variations is far simpler since now I have the code and conditions set out - it's simply a case of creating the tiles and telling the system to randomly pick from a set of tiles that match that particular slot. As I add different types of tiles (dirt walls, rock walls, chasms, water and so on) they all can use the same system - it's just a case of changing the sprites! This system was particularly important towards graphically improving this project - and whilst it had it's complications - I love the result and the potentially different additions I can implement with it! I've managed to get a start on being able to equip items to your character (force?) - it will take some explaining however for you to understand why I'm doing it the way I am. As a character you will have a number of 'units' that will in turn determine your stats. Equipment works in a fashion you would expect when you have multiple units to equip items to. Each unit can equip a weapon and an armour piece currently - which will give it a benefit to the stats it confers. The above diagram shows how the system will work. With the above - your character will have 15 attack total. If say all your footsoldiers had swords - then you would have a total of 20 attack. It is also worth noting that if you don't have any units to equip a particular weapon to (say bow to archers) then you cannot equip it. Units are the key point in this project for all systems to function - they determine your stats, they equip the items you find and they represent your overall progression in the game. As you can see in the Available tab you have 1 / 1 - the right integer shows how many of a particular weapon you have, the left integer shows how much you have that you can equip to a unit. On the right under Equipment Details - you can see how much units have weapons / armour equipped out of your total of those units. The button between the two allows you to equip x1 weapon - depending on how I decide to expand on this I'll likely adjust this accordingly for the sake of convenience (if you have 100 units - I don't particularly want to have the player have to press the x1 button 100 times). Above we have the same interface - but we have equipped the Iron Sword to one of our footsoldiers! This system provides a lot of flexibility in terms of equipment. I can create simple equipment that confers certain benefits - but the player is free to equip as much or as little of that equipment as they wish - which means they could realistically create their own equipment in the overall sense. Let me explain. Lets hypothetically say for now that you are able to have different types of damage, physical, lightning, fire, so on. 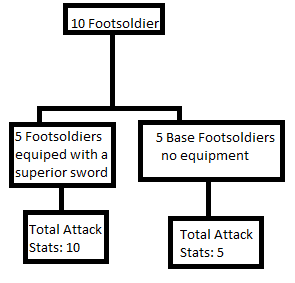 Say you have 10 footsoldiers with 1 attack base, you equip 5 with a sword that adds +1 attack and +1 fire damage; then you equip your other 5 with a sword that adds +1 attack and +1 lightning damage. That means in combat - you will deal a total of 20 normal damage, 5 fire damage and 5 lightning damage. Effectively the combination is something you as the player have made - not me as a developer. This opens up a number of possibilities to experiment and explore different equipment designs and sets! Until now - you don't gain benefits from equipping items, and you cannot unequip them - I will be working on that next, but I think the most challenging part has been dealt with so I hope to not have too much issues on those two elements.